When you own an outdoor pool, you want to wake up every morning to pristine, turquoise waters that are just begging you to dive in and begin your day with a few invigorating laps. Of course, the reality of keeping that pool water as clear and inviting as you want it to be can actually be a lot more stressful. While some pool owners hire people to keep their pools looking perfect or invest in fancy pool skimming machinery, for most people it is more appealing, financially at least, to take on keeping their pools clean themselves. Outdoor pools will attract an astonishing amount of surface debris, even in the space of just a day. Leaves, bugs, petals, and anything else that can fall or be carried by the wind can end up on the surface of your pool. While the odd leaf or flower may not seem all that offensive, if you leave things like these they become heavy with the water they soak up and sink, making them far more of a pain to remove. For this reason, it makes sense to grab a net every morning and quickly scoop out this unwanted debris while it is still afloat. Pool vacuum cleaners are a great thing for any pool owner to have in their arsenal, as by running a pool vacuum over the pool floor once a week you can get rid of any settling algae or calcite deposits and also remove any debris that has settled at the bottom. The best kind of pool vacuum for you will depend on the type of pool you have, but there are lots of well tested varieties available and it is well worth buying one. It will keep the water in your pool clearer, and also cleaner and safer, so you won’t need to add so many purifying chemicals. Pool vacuums are easy to use, and can be handled in the same way as you would handle a Hoover going over a floor in your home. While a pool vacuum can do a great job of cleaning up the pool floor, for the walls, it is best to use a brush once a week to remove algae and other unwanted grime. With concrete walled pools, use a stiff brush that can scrub problem material away. If you have more delicate walls, for example lined with fiberglass, tiles or vinyl, use a softer brush and work more gently to dislodge calcium deposits, algae and dirt without scraping away any of the grout or damaging the appearance of the wall itself. With companies like Bay Area Pool Service, with location searching capabilities located at http://bayareapoolservice.com/locations/naples-pool-service.aspx for consumers, knows that simple pool maintenance can avoid big time issues. By skimming every day and following a weekly regime of vacuuming and brushing the interior of your pool, you can enjoy clear, clean water with only a couple of hours’ effort per week! 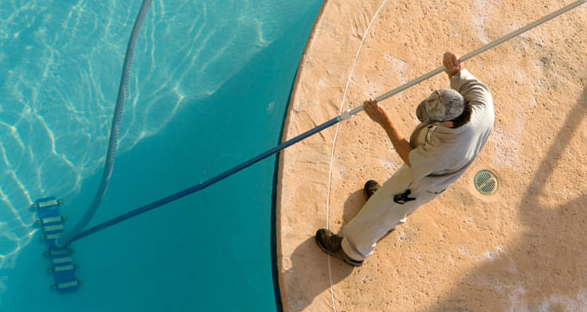 If you do need someone for your pool maintenance needs, Bay Area has many southern Floridians covered.